The Spontaneous generation hypothesis proposed by scientists to explain the origin of the “animalcules" observed by Antoni van Leeuwenhoek in his magnifying lenses had received wide acceptance all over Europe from Antoni’s time until the time of Louis Pasteur. Erroneous experimental set up, results, and conclusions of some scientists had supported and strengthened the hypothesis. For example, the Englishman John Needham claimed that vital life is needed for the spontaneous generation of microbes. He added that the reason why no living organisms emerged from heated and sealed solutions in containers is that the “vital life" was destroyed by the heat and new “vital life" was not supplied to the solutions because they cannot enter the sealed containers. Fortunately, there were scientists skeptical about the hypothesis, so they designed their own experimental set up and from the results they gathered, they drew the most feasible explanation on the origin of the “animalcules".Among the scientists was the Italian Lazzaro Spallanzani who opposed Needham’s idea of the “vital life" (Go back to part 1 of this series to read on Spallanzani’s argument). Proponents and opponents of spontaneous generation hypothesis debated a lot starting from the time Leeuwenhoek presented his discoveries (1670s) to the public until the time of Rudolf Virchow, who in 1858 challenged the spontaneous generation with his concept and definition of biogenesis. This concept claims that living cells can arise only from preexisting living cells. Virchow defended this concept to the scientific community but he did not come up with a convincing experiment to back up his idea. 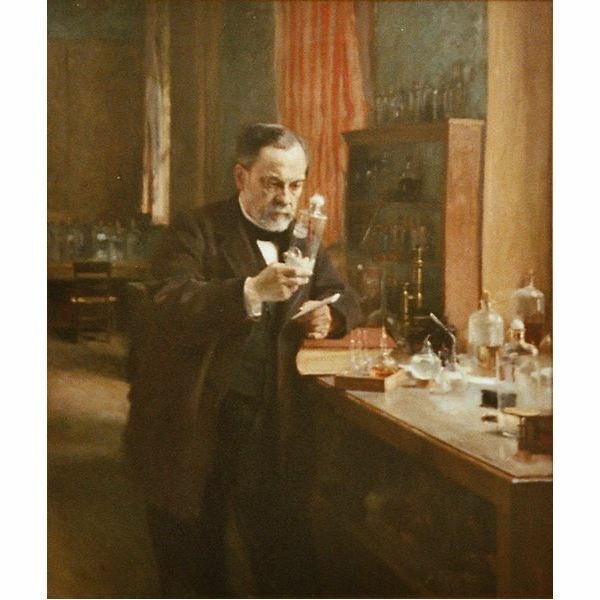 In 1861, the French scientist Louis Pasteur resolved the issue on the origin of microbes (“animalcules") through a series of ingenious and persuasive experiments. Pasteur showed that microorganisms exist in the air and can contaminate sterile solutions, but he emphasized that air itself does not produce microbes. He filled a number of short-necked flasks with beef broth and then boiled their contents. He immediately sealed the mouths of some of the flasks while he left the others open and allowed to cool. After few days, the contents of the unsealed flasks were found to be contaminated with microorganisms. No evidences of growing microorganisms were found on the sealed flasks. Pasteur concluded that the microorganisms in the air were responsible for contaminating non-living matter like the broths in John Needham’s flask. Pasteur performed another experiment but this time he put beef broth in open-ended long-necked flasks. He bent the necks of the flasks into S-shaped curves and boiled the contents of the flasks. Amazingly, the contents of the flasks were not contaminated even after several months. The unique S-shaped design of Pasteur’s flasks allowed air to pass but trap microorganisms that may contaminate the broths.Do you know that some of the original vessels used by Pasteur in his experiments are still displayed in the Pasteur Institute, Paris today? A few of the flasks contain broths that remain uncontaminated for more than 100 years! Pasteur demonstrated the presence of microbes in non-living materials whether they are solid, liquid, or air. In addition, he laid the foundation of aseptic techniques, techniques that prevent contamination by unwanted microbes. These techniques are based on Pasteur’s idea that microbes can be killed by heat and that procedures can be designed to inhibit the access of airborne microbes to nutrient environment. Application of aseptic techniques is now the standard practice in medical and laboratory procedures. Disproving the idea that microorganisms spontaneously generated from non-living matter through mystical forces is one of the greatest contributions of Pasteur in science. He provided the evidence that any appearance of “spontaneous" life in nonliving solutions can be attributed to microbes that already exist in the air or in the fluids themselves. Serafini, Anthony. 1993. The Epic History of Biology. Plenum Press. Madigan, Michael. 2006. Brock Biology of Microorganisms. Upper Saddle River, N.J. : Prentice Hall/Pearson Education.